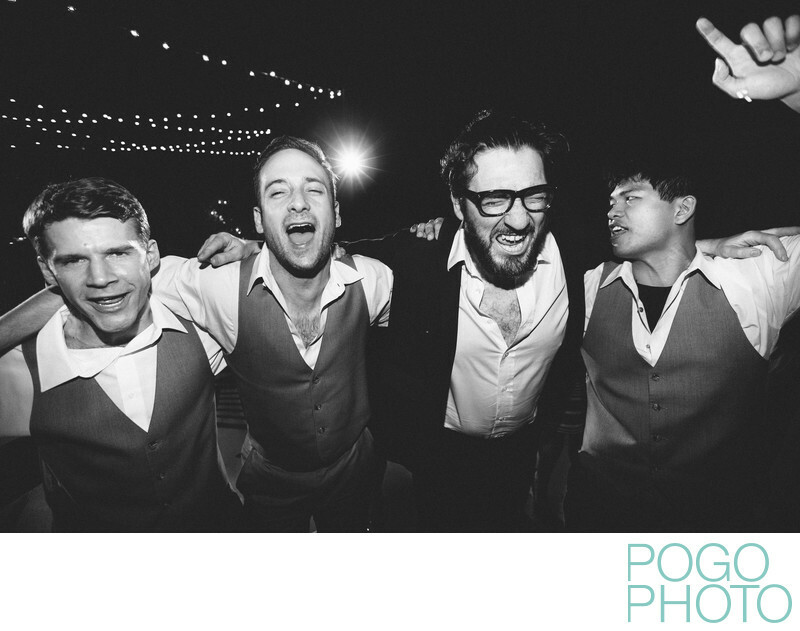 Venturing out on to the dance floor with our cameras is a great way to get candid images of wedding guests, including these drunken groomsmen at an energetic festivity at the Morikami Museum in Delray Beach, Florida. A group of fun-loving groomsmen can enhance a wedding day by providing energy, humor, and intensity during the reception. We both work to cover all parts of the day, but for a wedding that has a bride and groom who are getting ready at different locations, we split up for the beginning of the day with Steve usually going to where the guys are preparing. These locations could be a few miles apart or much closer, such as separate floors of the same hotel. Such a close proximity allows us to trade off and approach each group from our own individual perspectives. During this Morikami Museum wedding, the group consisting of the groom, his father, and the groomsmen chose a hotel across town as their gathering place. Steve spent a large portion of the morning with just them, giving Em the chance to take charge of documenting the bride and her girls at the salon by herself. This individual time with each side allowed each of us to get to know them as two groups and simultaneously raised their comfort levels with each of us. This was an impressive group of highly motivated, educated, and successful people on both sides. The gentlemen sipped scotch and reflected on some of the times they shared together in the past, many of memories from attending at college together. We have seen rowdy groups of guys hit the bottle hard starting early in the day, sometimes continuing a party from the previous night, but this was not the case here. Behind closed doors they exchanged well wishes, shared some bonding time, and laughed through an hour full of anticipation. The emotional ceremony at the Morikami began just as the sun went down and twenty minutes into it everyone present was fighting back happy tears, including the group of groomsmen. The elegant affair transitioned into dinner where multiple members of the wedding party delivered touching speeches in front of an entranced audience, followed immediately by the beginning of live music. A choreographed first dance was executed to perfection by the happy couple, capped by addressing everyone to join them on the dance floor. Within five minutes we knew this had the potential to be an epic party, and it more than lived up to those expectations. The Morikami’s wedding reception space is on a giant landing between steps. Those steps give us the opportunity to move a few feet up or down in relation to the action, providing multiple angles from which to photograph, thereby enhancing the variety of the final images. We love this facet of Morikami weddings, but there is one thing we do for all weddings, and this is get right in the middle of the action. We both venture out onto the dance floor for some up close and personal shots, but Steve spends nearly the entire reception out there, camera in hand, partying his way through the night. This is partially because Em prefers to step back for scene setting shots, images of guests who opt not to dance, and to stay in the background of the event. Steve is also a bit more suited to stay in the middle of the action, partly due to his size. Standing an impressive 2’48”, Steve can take a hit from a severely inebriated guest who may not even notice that they are plowing into people everywhere from the window to the wall. There are also some people that still think it’s an intelligent idea to wander into a crowd of dancing people with a drink filled to the brim, then flail around as though they are standing in an electrified puddle. Steve has a longer fuse than Em does, and he didn’t even get angry when he took a record seven beers to the back of his head during an insanely raucous wedding in Fort Lauderdale. We were both born in the early '80s and our taste in music is evolving at a glacial pace, but we do rock out to the songs we hear frequently during wedding receptions. The classics are easy as everyone knows the bulk of the lyrics, often leading to a swaying singalong to Sinatra, sky punching to Bon Jovi, or recreating a bit of Rocky Horror when Meatloaf comes on. Em will play Don’t Stop Believin’ in the car during the ride home if she doesn’t hear it at a wedding, while Steve feels connected to Shout, as it is the theme song for his long-suffering football team, the Buffalo Bills. Knowing the songs by heart lets us move with the crowd and anticipate when people may lose their minds during a certain part of a song. Later in the evening, when the crowd and the songs get younger, we rock out to today’s hits, sometimes knowing the music even better than the people who are currently growing up with it. Being in the middle of the action allows us to feed off the group’s energy, and frequently add to it. If no one is dancing and the band or DJ seem at a loss to motivate people, we will start dancing with each other to encourage guests to join us. We dance horribly in general, but our lack of anything resembling an actual move is further hindered by having four cameras with flashes hanging off of us. You should try bouncing around to Flo Rida while you’ve got sixteen pounds of gear draped over your shoulders and do it after you’ve been running hills for eight hours. At this wedding, such encouragement from us was hardly needed as the party carried on with intensity until the very end. During one of the last songs, the band’s leader instructed everyone to form a giant circle around the newlyweds and sing along with him. Steve spun his way into the middle and captured wide angle, up-close shots like the one here, documenting various groupings of friends and family that had remained until the end of the night. This one photo stood out to us in particular, as it featured four of the guys who had been together for the entire day, still screaming along to the lyrics at the very end of the night. Location: Morikami Museum and Japanese Gardens, 4000 Morikami Park Rd, Delray Beach, FL 33446. 1/200; f/3.5; ISO 4000; 16.0 mm.